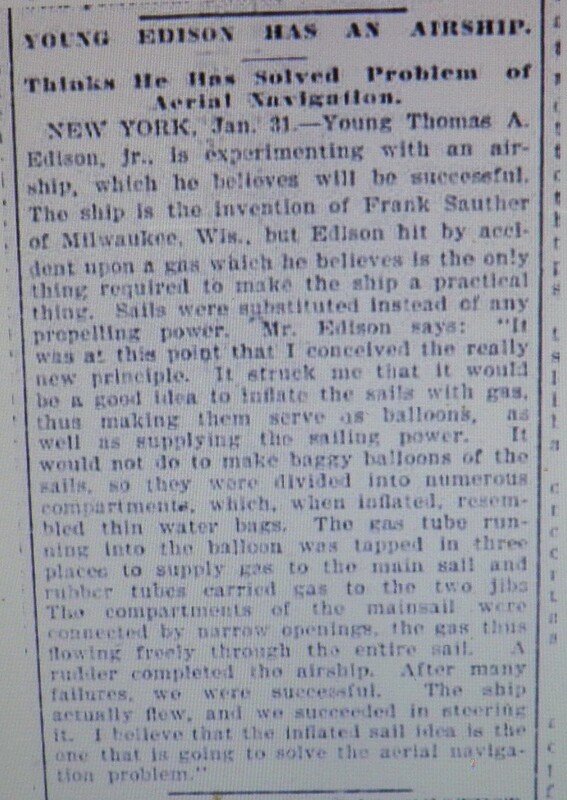 "Young Thomas A. Edison, jr., is experimenting with an airship, which he believes will be successful. 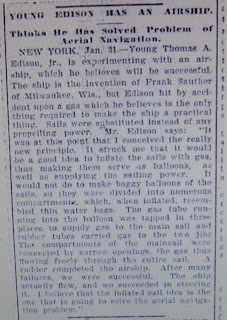 The ship is the invention of Frank Sauther of Milwaukee, Wis., but Edison hit by accident upon a gas which he believes is the only thing required to make the ship a practical thing. Sails were substituted instead of any propelling power. Mr. Edison says: 'It was at this point that I conceived the really new principle. It struck me that it would be a good idea to inflate the sails with gas, thus making them serve as balloons, as well as supplying the sailing power. It would not do to make baggy balloons of the sails, so they were divided into numerous compartments, which, when inflated, resembled thing water bags. The gas tube running into the balloon was tapped in three places to supply gas to the main sail and rubber tubes carried gas to the two jibs. The compartments of the mainsail w ere connected by narrow openings, the gas thus flowing freely through the entire sail. A rudder completed the airship. After many failures, we were successful. The ship actually flew, and we succeeded in steering it. I believe that the inflated sail idea is the one that is going to solve the aerial navigation problem.'" Thomas Edison produced an improved light bulb in 1879. We all can be grateful to Mr. Edison for making electric lighting a wonderful thing! But his airship? Ummm, Mr. Edison, the airship was not such a great idea. P.S. I will be posting some photos from Lennie's version of a high school photo album. Stay tuned. I've enjoyed these little glimpses into the past. Thanks for posting these. Fascinating bit about the airship! I knew Edison had many patents, but didn't realized he dabbled in this.